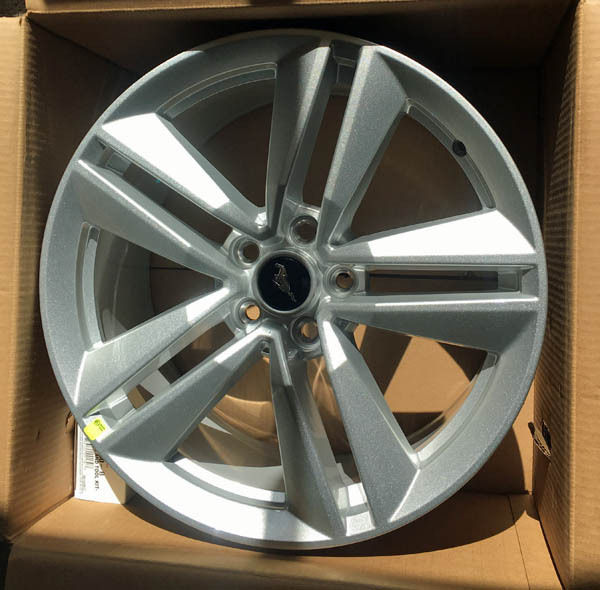 My new wheels just arrived direct from Ford Performance. They are the EcoBoost performance package 9 x 19 wheels except they are sparkle silver instead of black. They came as a set of 4 with the TPMS for $395 + shipping. They will look good on the car. But, now I need to get tires. I'm thinking Michelin Pilots or Continental Extreme Contacts or ???. Any ideas or comments on tires would be good. I've always been happy with Contis, but the Michelins have real good reviews. It's got the stock Hankook Ventus 235/60 17s on it now. I was thinking 255/40 19 on the new wheels.